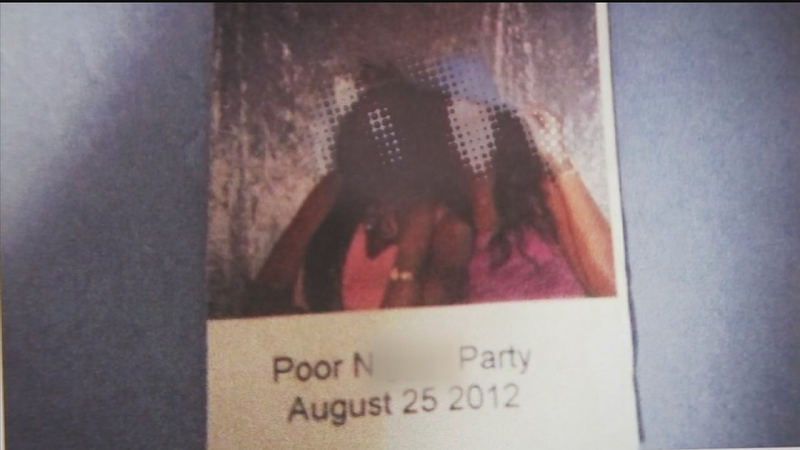 HOUSTON (KTRK) -- A Fort Bend County couple has settled a lawsuit it filed against the owner of a photo booth after a racist photo caption appeared on some of the guests' printed pictures. The wedding was in August 2012 at a venue in Garden Oaks. The bride and groom, both African-American, hired Premier Photography owned by James Evans to provide an attendant and photo booth at the reception for guests to take photos commemorating the union. The photo caption was supposed to say the couple's first names and date. Instead, for some guests, it said "Poor N***** Party." "Anybody would find this caption offensive. I'm offended by it. I don't want to say it," Attorney Cathy Hale told Eyewitness News. The couple sued Evans and Premier Photography, claiming not only breach of contract -- for a memory stick of photos they say they never received -- but also for negligence and mental anguish. On Thursday, the two parties reached an agreement before the case went to trial. "I am deeply troubled that the racially inappropriate caption was generated at an event where Premier Photography was present... Neither I nor Premier Photography have ever condoned such language, and we strongly denounce its use on any occasion." "My clients accept Mr. Evans' and Premier Photography's statement that he and Premier Photography reject the inappropriate caption printed on the strips and what they represented."